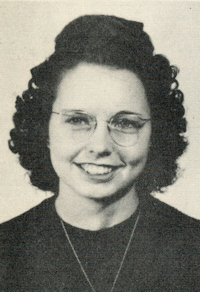 Obituary – Laughlin, Nadine Faye (Milliron) « Perry High School Alumni Association, Inc.
Red Hots ’44-’47; Cheer Leader ’46-’47; Perry-scope ’46-’47; Sec. of Homeroom ’45-’46; Librarian ’46-’47. 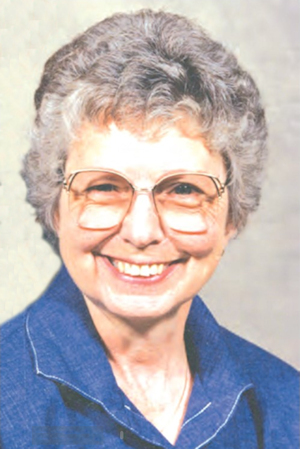 Nadine F. Laughlin longtime Ponca City resident passed away Thursday, May 31, 2018 evening in Ponca City. She was 89 years of age. Nadine was born on December 11, 1928 in Cushing, OK to Leo and Elsie Cowell Milliron. Nadine met the love of her life, James “Jim” Laughlin and on June 6, 1950 in Perry, OK they were married. they made their home in Ponca City, OK and she was employed as a secretary for Oklahoma Natural Gas for numerous years. Nadine was a member of the Ponca City First Baptist church. She enjoyed traveling with her husband. Her passion was bowling and she would travel to numerous tournaments and she was a member of several different teams throughout her bowling career. She was inducted into the Ponca City Bowlers Hall of Fame in 1995. Survivors include her 2 sons; Mike Laughlin of Ponca City and Terry Laughlin and wife Patty of Cedar Hill, TX, 1 sister Barbara Jirous and 1 brother Don Milliron, also surviving are 2 grandchildren; Cory Laughlin and Aaron Laughlin and 7 great grandchildren and several nieces and nephews. She was preceded in death by her parents, husband, Jim, of 67 years in 2017, 1 grandson Steven Laughlin and 1 sister, Charledean (Milliron) Wiehe.